It might seem improbable, but it took until 1980 for Bob Dylan to win his first Grammy*. Even more improbably, it came for the vocal performance on “Gotta Serve Somebody”. That Dylan would have never won as a songwriter but would win as a singer is a shock. That he won for what is about his fortieth best vocal performance is even odder. Well, the Grammys never have been a particularly credible award. Dylan had lost his share of Grammys before 1980. Two of note were the fact that he lost Best Folk Recording in 1963 (for his first album, Bob Dylan) to Peter, Paul and Mary’s If I Had a Hammer (that a defensible decision) and then again in the same category in 1965 (The Times They Are A-Changin’), to Gale Garnett for “We’ll Sing in the Sunshine” (the Grammys seemed to have pitted albums against singles in those days). I have to be honest and admit that I had never heard of Garnett prior to this morning, though, of course, I know the treacly song well. In 1969 he lost Best Folk Performance (John Wesley Harding) to Judy Collins’ “Both Sides Now” (again, defensible). The next year he lost Best Country Instrumental Performance (“Nashville Skyline Rag”) to The Nashville Brass. The nomination in 1980 was only his sixth ever, and, his first win. Astonishing. 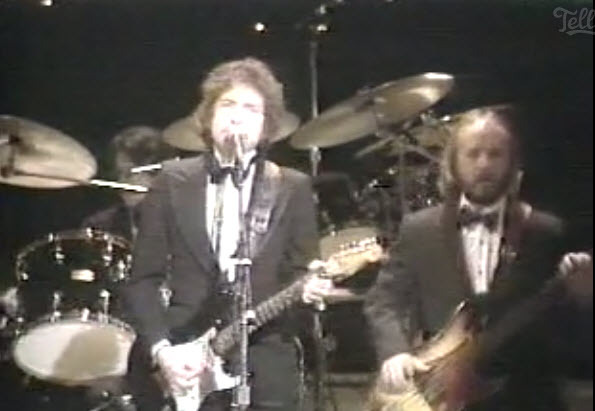 Dylan and his band performed this song at the show in tuxedos and black gowns, and he received an enthusiastic standing ovation (Kris Kristofferson is positively beaming). You can watch the video of the performance here. 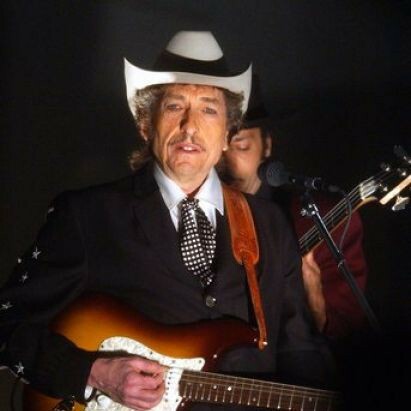 This is actually a rather good live performance of the song that is quite indicative of the way that Dylan was performing it live that year (far superior to the SNL version). The only video of him actually accepting the award that I could find was on the Grammys site – it is about one second long but you can see it here (plus the Doobie Brothers!). I’m not sure what to make of all this. Good live performance, bizarre thing for him to win. For the record, this was the first time that an award was made in this category and he beat out Joe Jackson (“Is She Really Going Out With Him?”), Robert Palmer (“Bad Case of Loving You”), Rod Stewart (“Blondes Have More Fun”), and Frank Zappa (“Dancin’ Fool”). Quite the bizarre range of nominated material. *technically he shared a Grammy for his contribution to Concert for Bangladesh, but I’m going to discount that since it really wasn’t his project.